Fitbox is the first all-in-one app in the Health and Fitness category. But Fitbox is NOT your typical all-in-one app. The majority of the apps included in Fitbox are part of a unified database, allowing you to track and compare your progress in multiple areas across multiple data sets. Chart your weight against the average length of time you run, or your BMI against how many pushups you average or even your performance on biceps curls against your average Blood Alcohol Level! The possibilities are endless with Fitbox. 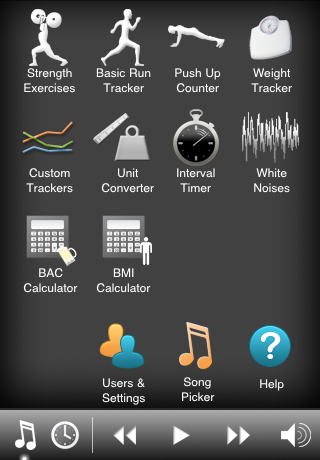 Add your own trackers and exercises in both the Strength Exercises app and the Custom Trackers app. Fitbox lets you track anything you can think of - not just what we thought of. Fitbox is the all-in-one solution for tracking your progress in numerous (and yet to be conceived) health and fitness related areas. You don't even have to leave FitBox to control your music! Just use the song picker and the music controller at the bottom of the screen! By *conservative* estimates you're saving $6 on just a fraction of the apps included! - Flexible model allows you to track multiple types of data: weight, time, distance, numeric, and log notes.